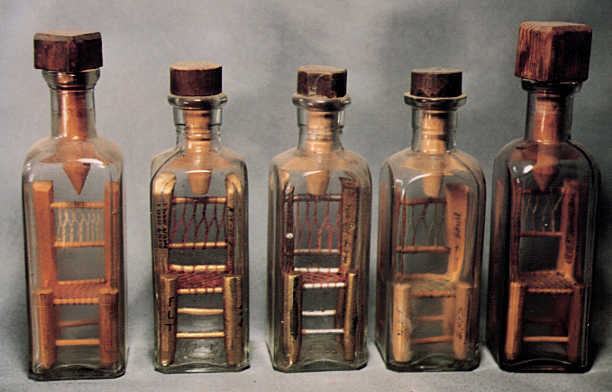 4 to 5" square bottles, no markings These five chairs are all alike and may have been made in the same place by different people. The seats are similarly woven in yarn. Some are painted gold. One is signed "C. W. Griffin IOOF". Another says "Odd Fellows Home Liberty Mo. Col. Barnhart 11-12-1921" and another is dated 2-8-1927. Yet another simply has the initials "F.L.T.," for the Odd Fellows' motto "Friendship, Love and Truth." A larger one (c. 9 1/2"), not pictured, is known and is signed "A. Schopf, Odd Fellows Home, Mo." and was found in Kansas City, and a single chair made by Col. Barnhart is shown on this website. All of these named people were living in the Odd Fellows Home in Liberty, MO, in the 1920 census. A. Schopf was Amos Schopf, born ca 1854 in Indiana. G. G. Barnhart was born about 1853 in Missouri. Chas. Griffin was born about 1861 in Iowa.